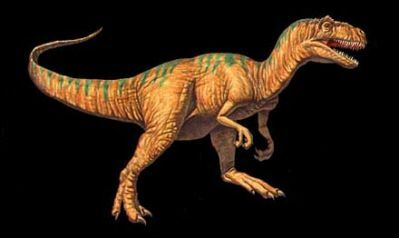 The Allosaurus, meaning "different lizard", was the largest land-living carnivore and the fiercest other than the famous T-rex. It was named different lizard because its vertebrae were different from the other dinosaurs known at the time of its discovery. It had a huge skull that was balanced by its long and heavy tail. It had very large and powerful rear legs and its front arms were short with three fingers and claws. Even though the Allosaurus was huge it actually had a lot in common with birds of today. The claws look very much like an eagle, large mouth more for swallowing than chewing, a wishbone, and a neck with vertebrae that was hollow for air sacs. With an amazing finding in UTAH brought over 40 complete skeletons. If you ever see one in a museum then now you know where it came from. Also in the same land area lots of Stegosaurus, Diplodocus, Camarasaurus, and Apatosaurus species. Utah must have been one hot spot for fossils. The allosaurus also was found in Montana, Wyoming, South Dakota, Colorado, Oklahoma, and New Mexico.